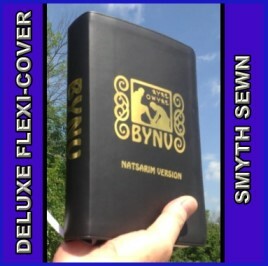 The Besorah of Yahusha Natsarim Version is a new translation by Lew White. 1224 pages, 6" x 9" soft cover and the spine is 1.5". The font is Tahoma size 9. The Besorah Of Yahusha Natsarim Version is the 66 books of Scripture in English, written for the current generation of Millennials. It uses plain English for describing the original ideas; instead of firmament, or expanse, it uses the word space. The true, original Name of Creator is used throughout, written in the original ancient Hebrew characters, yet leaving the rest of the text in English words. Uniformity of vocalization for the Hebrew letters in the names of many characters in the text is maintained; all Hebrew names are transliterated using English letters to sound them accurately, as closely as possible. The order of the 66 books is another feature, enabling the reader to flow from one book into the other; 2 Kronicles ends, and goes right into the book of Daniel, taking the reader from where the last book left off. There is a glossary for those who want to study certain words they encounter, and most books have the meaning of the book beside their title, providing the reader with more insight into the person that recorded it. The names are restored to be pronounced more correctly. Nahum is Nakum; Jonah is Yunah, Moses is Mosheh, Joshua is Yahusha, Joseph is Yusef, and so on. From Genesis (Bereshith) to Revelation, any reader will be fascinated with the truthful, clean message in this publication. In fact, "Besorah" is the Hebrew word that means message or report, that became the Old English term, Gospel, from the Greek euangelion. The Hebrew roots have been severed for most of the last 2 millennia, and this publication is an effort to restore them so the Truth comes through once again, and the famine of the Words of Yahuah ends, and His Word can go forth once again into the world. This book will challenge the experienced student of Scripture, and pour clean Living Water into the fresh minds of new seekers. This new version uses the palaeo-Hebrew script for the Personal Name of our Creator, Yahuah, and our Redeemer's Name, Yahusha. You will read the Word of Yahuah in clear English, based on what the words simply mean. Just imagine reading about Creation, and seeing that Yahuah created the sun, moon, and stars in the "space" He created, rather than the "firmament" or "expanse"? There will be no one steering you away from obedience to Torah in footnotes, turning the message into "wormwood".